^ Hargreaves hints at Man Utd deal. BBC體育. 2007年5月20日 [2007年5月20日]. 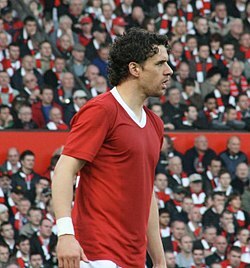 ^ Owen Hargreaves makes Manchester United comeback. BBC Sport. 2010-03-18 [2010-03-19] （英语）. ^ Man Utd 2 - 1 Wolverhampton. BBC Sport. 2010-11-06 [2010-11-10] （英语）. ^ 夏格維斯總是傷傷停停，這次也會一樣嗎？. Goal.com. 2011-01-21 [2011-01-21]. ^ Cass, Bob. It's all over for Hargreaves as Ferguson confirms midfielder's exit. Daily Mail. 22 May 2011 [22 May 2011].